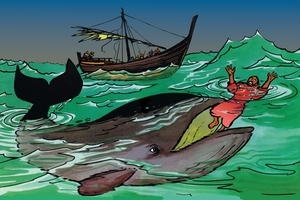 Grandes lignes: The story of Jonah for children. Did you ever hear about the man who tried to run away from God? And the strange and terrible thing that happened to him? I hope you will never make such a mistake. You see, he was a Christian, and if you are a Christian--then of course you must do what God tells you to do. And one of the things God says a Christian must do is to go tell others about Him and tell them how to be saved. "Work, for the night is coming!" That means you and me NOW, and it meant Jonah THEN. But Jonah didn't want to, and here's the story: One day God said to Jonah: "Go to the big city of Nineveh and thunder in their ears that I see all their wickedness." Well, Jonah didn't want to be a missionary this time and go and preach to those people. So what did he do but just hurry right down to the seashore and pay his fare and get on a big ship that was going somewhere else! When the big ship began to move out from the dock, I guess Jonah thought he was safe. Well, do you think any person can run away from God? You listen and see if he can. Away the ship sailed out on the waves, and everything was going fine. But suddenly a furious wind began to blow and it shook the ship. Soon there was a heavy storm. The waves got so high they splashed into the ship. The sailors who took care of the ship began to get scared. But when Jonah saw how the waves beat against the ship, he knew that God had sent the storm. God was still wanting him to obey and be His missionary to the people of Nineveh and preach about the results of sin. But the sailors didn't know what was the matter. They began to pray to their idols. Of course their idols couldn't stop the storm. It just got worse. Then they asked Jonah why he didn't pray. So he told them he had disobeyed His God--the real true God! Then he said "If you will just throw me out of the ship into the sea, the storm will stop and you will be safe." They didn't want to at first, but it began to look as if they would all drown. So at last they picked up Jonah--and out over the edge of the ship they swung him, and splash into the sea he went. And sure enough, immediately the storm stopped. Then the strangest thing happened. God had a great big fish like a whale, waiting right there. When Jonah splashed into the sea, the big fish just opened wide its mouth and down went Jonah! Swallowed whole by the giant fish! Well, I guess you wouldn't like to be in a fish's stomach for three whole days and nights--any more than Jonah did. No Sir! It was black, dark and I suppose it didn't smell very good. But Jonah knew it was his own fault. After a while, he decided to pray. Not to the sailor's gods and idols--oh no--there was only one Person that could help him. He prayed to God---the only real GOD! When God saw that Jonah was really sorry and ready to obey Him--then he made the big fish go near the shore and it threw-up Jonah on the land. Well, you can be sure Jonah obeyed God this time! He headed for Nineveh as fast as he could go, and began to preach. And because Jonah told them about God, do you know what happened? Hundreds and hundreds and hundreds of people began to pray, and were saved. All just because one man obeyed to what God wanted him to do. God says to you and to me: if we are Christians we are to "Go and tell EVERYONE the good news that Jesus can save them." If you do that, you will be a real missionary---right now---but if you don't you will be disobeying God like Jonah did. Here is the verse from the Bible that tells you to be a missionary NOW, WHEREVER you are: "Go ye into all the world, and preach the gospel to every creature." GRN has recorded a version of this script in 4 languages and dialects. See full list.